Good. [ No Hassle 30 Day Returns ] [ Edition: seventh ] Publisher: Barron's Educational Series Pub Date: 2/1/2016 Binding: Paperback Pages: 424. Good. Lots of notes throughout. 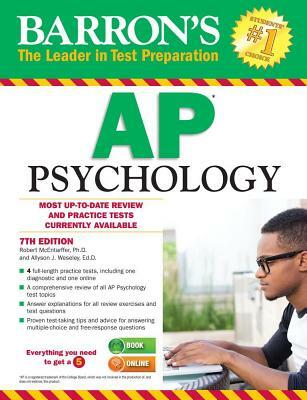 Barron's AP Psychology, 7th Edition. by Deborah T Goldberg, M.S. The actual cover of the book was bad, which wouldn't have mattered if the interior had been in good shape (it wasn't). Whoever had the book before me was highlighter crazy; entire pages are highlighted and marked through that makes any of my own studying impossible. If there is any possible way for me to get a refund, I will. I guess you get what you pay for (I have lost hope in humanity). I am very pleased with my whole experience with this seller. The book arrived quickly and in great shape. I will certainly buy from this seller again. Thank you! !